The names of NBN Co employees communicating with ALP staffers were seen on emails during AFP raids in Melbourne last year. If Labor keeps joining the banks, the global corporations, the industry bodies, it is not just the political party that will end up the loser. With Stephen Conroy departing the scene, will Victorian Labor finally be free of the undemocratic embarrassment that is the Stability Pact? Former Bendigo MP Steve Gibbons is not holding his breath. The Victorian stability pact has prevented outright war in Labor. Bill Shorten has unbalanced it, writes Labor insider Ben Chiefly . Bill Shorten pushed for former HSU official Kimberley Kitching to take on Stephen Conroy's vacant Senate seat, over the strenuous objections of Transport Workers' Union. Labor insider Ben Chiefly has all the goss from the room. 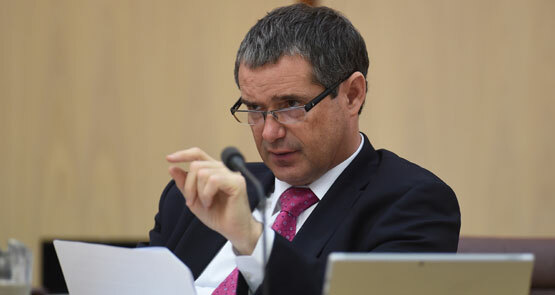 He tried to stop your moral decay, but Fake Stephen Conroy has howled from the Senate for the last time.